1. Pulled red orange and yellow orange fire energy from her entire body to reduce her panic and movement. I dumped all that excess fire energy into a nearby power transformer. She calmed down enough so I could begin to locate the source of the choke. 2. Ran my hand along the bottom of her neck (about an inch away from her neck) until I felt the "hot spot" where the food was stuck in her throat. 3. Began flowing water energy into the area to move the stuck food along. Within about 5 minutes of flowing water energy, she really calmed down and almost went to sleep. I continued this process for another 15 minutes. Within an hour, my horse was up and grazing calmly as if nothing had happened. I was delighted! It definitely showed how energy could move matter (the stuck food). Even more important, this experience showed me why I had spent all those hours practicing my magical techniques, such as throwing bolts of fire energy to make a candle flame jump. The repetitive practice allowed me to act without thinking in an emergency situation, and to resolve the potentially life-and-death problem quickly. That same practice has stood me in good stead when it comes to self-defense. I was once verbally attacked at a picnic by a drunken man on a tirade. He was advancing on me quickly, yelling all sorts of insults. I backed up against a drinking fountain, which makes an excellent electrical ground, and began pulling fire energy, the energy of rage and drunkenness. I didn't have time to think, I just did it. Luckily angry people radiate fire energy at an immense rate and I was able to pull and ground most of his excess energy. By the time he got within 2 feet of me he had lost steam. He looked confused for a moment, and then wandered off while muttering under his breath. Had I taken the time to think, he might have started in with the physical abuse. I admit that I used to get very bored and twitchy when it came to the repetitive practice with air, fire, water, and earth energies. The practice seemed so remote from any use that I might eventually have for it that my mind would just wander off to other topics. But events like these really bring it on home for me. Practice, boring though it may be, keeps me from panicking when I need to act quickly. It's a realization I'm supremely grateful for because it keeps the practice of magic real for me. Magic then emerges from the land of strange "out there" stuff and into the practical nitty-gritty of my everyday life. You can get on board with using real magic to help with everyday problems and issues in your life with our Complete Guide of Witchcraft for Beginners. It is a magical truth that you can be, do and have everything you want in life. This is not a new concept as master teachers world-wide have been teaching it for ages. All that is necessary in getting everything you want is to ask the Universe and sit back and let it deliver. It's like being in a great magical café. You select what you want from the menu of infinite possibilities, place your order and the Universe delivers. So why aren't we all doing this? You first have to get yourself to the "restaurant" and second make yourself ready to receive. One way to enter the "restaurant" is by doing daily rituals. These are small planned actions that connect us with what we want in life and put us in the energetic space to be able to receive. Daily rituals can help you release pain, start the day and end the day in a magical way, get help from higher powers and beings, and access knowledge from the Universe. You'll find a wide variety of these in our Daily Rituals for Attracting What You Want in Life ebook. We've identified 5 of the main reasons more people aren't using this simple principle and manifesting all their desires. In previous articles we've explored four of these reasons in-depth and gave some magical solutions for turning them around. In this article, we will explore the number 1 reason we think interferes with the magical process - We Don't Believe We Can Be, Do, and Have Everything We Want. 5. We Think We Have to "Make it Happen"
The majority of us grew up hearing phrases like, "You can't have your cake and eat it, too." or "There's no such thing as a free lunch." With that philosophy being drummed into us it's no wonder we don't believe we can have it all. The lesson our society teaches is that if you want something, you have to give up something. The Universe however has no limits so we can ask for anything, create anything and receive anything and everything we want and there's still enough for everyone else to do the same. It's not a limited supply or inventory that will run out. The Universe we live in is continuously expanding and as more and more people begin creating, they can all be accommodated. There's no way we could ask for more than the Universe can handle. The real truth is that it is part of our jobs as human beings to create. It is one of the reasons we are here in physical bodies; to experience the process of creation. Doing daily rituals is one of the ways we can separate from our mechanical ways of living and rushing through everyday life to connect with the Universe and higher beings that can help us. That's why it's called "co-creating". We don't have to do it alone. It's our job to do the dreaming and asking, then to sit back and let the Universe do its job of delivering. We have to get out of our own way so to speak and trust that the Universe is limitless and can do its part. Basically, you have to believe in the magic that is available to you and allow it to work in your life. Do you ever feel lost in life? Do you wish you had some guidance on a particular issue or problem that keeps cropping up in your life? Or do you just need some reassurance that the path you are on is the right one from you? If so, it may be time to check in with the Spirit of Owl. 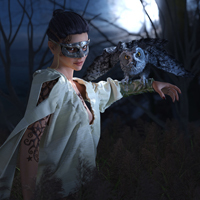 In many Native American and tribal traditions, Owl is a seer. You can ask the Spirit of Owl to assist you in seeing anything that is hidden from you in life. For instance, you can ask Owl to help you see what's blocking your manifestation, creating an illness or causing disharmony in your workplace. Owl helps you see anything that is hidden from you, including what other people are seeing and feeling. 1. Say aloud or in your mind, "Spirit of Owl, I request your help." 2. Wait a few moments until you feel the presence of Owl (no more than a few seconds). 3. State your request. For instance, if you need help seeing what's causing an illness, you might say, "Owl, please come with me today and show me what is causing this illness in my body. Please show me in a way that I can clearly understand. Thank you in advance for your help." As with working with angels and other spirit beings, appreciation is important. 4. Stay open to what Owl will show you. Owl will ride with you on your shoulder, whispering in your ear, giving you knowing and understanding where before you had only blindness and confusion. Owl may bring up old memories, send you a phrase from the mouth of a stranger or bring a chance meeting with another person. Owl will use any and every device to help you see. If at the end of the stated period of time, a day in the above example, you still don't understand what Owl is showing you, ask again the next day. Each day Owl will make it more obvious to you. Each time you gain a new insight or understanding, thank Owl for the help. Remember that Owl penetrates secrets and veils, and can show you anything you wish to know. To gain help from this quick-fixer, all you have to do is ask! Quick Note: You have the right to know and understand anything in this Universe. It's what you do with this information that's important! Want to learn more magic working with higher beings? If so then the Witchcraft Spell Book: The Complete Guide of Witchcraft Rituals & Spells for Beginners book is the one for you. Here's a shamanic secret from our magic that works tips to use when you need to be able to focus, are feeling distracted or powerless. This exercise will help you gain control over your life and empower you so that you can focus and stay on track with what you need to do to manifest your desires and accomplish what you want to in your life. This little shamanic secret is called "Doing an Act of Power" and you'll find it as one of the 10 magic that works rituals in our 10 Magical Quick Fixes ebook. And here's some even better news! You can get this ebook free just by visiting our website at www.shamanschool.com. Here's how to do the Acts of Power exercise. Pick a very simple act that you can perform simply and easily. For example, make a mark on a paper or pick up a pen or touch your nose with your right index finger. It doesn't matter what the act is as long as it is simple and one that you choose. Make a conscious decision as to when you will start your chosen act, how long it will last and when you will finish the act. For example, if you chose make a mark on a paper, you can say it will start now, will take 2 seconds and will end when the mark is made. Now do it. You have decided on an act, defined its parameters, so do it. That's it, you have just done the shamanic secret of doing an act of power and restored your personal power. Sounds almost too easy doesn't it? But it doesn't matter what the act is because any act done with intention is an act of magic and can be an act of power. Doing acts of power on a regular basis allows you to start doing these acts naturally without having to think about the steps. With practice your acts of power can become longer and larger acts, but starting with short simple ones gets you going. The next time you find yourself needing some help to stay focused, on track and clear about your goals and aims, join thousands of magical practitioners and shamans in using this shamanic secret and do a simple act of power. This is magic that works when you need a magical empowerment boost. Whose Personality Are You Wearing? As you grow older and hopefully wiser do you ever shock yourself when you realize that you sound just like your parents? If you've ever caught yourself looking at the world just like your parents do-a point of view that you no doubt used to find hopelessly old-fashioned and out of date-you might suddenly feel old or, worse, unoriginal. Here you've spent years rebelling and trying to break the familial mode just to find yourself parroting your folks! If you've ever found yourself in this spot just take a deep breath and relax! Things are not as bad as you think. From a human development point of view it's actually quite normal for us to look and sound like our parents when we reach a certain age. The question is why. Think about this scenario: when you were a child your parents were probably in their 30s, 40s or 50s. As a child you are very impressionable and you observe and absorb the personalities of the people around you. In animals this process is called "imprinting." What you're really absorbing from your elders is a blueprint for how people think and behave when they reach a certain age-say 35. It's only natural that when you reach age 35 you automatically assume the mannerisms and personality traits of the people you observed as a child. You've been programmed to do so. But don't give up hope! Just because it's natural for you to act and sound like your parents doesn't mean you're doomed to live their script the rest of your life. It's never too late to change your imprinting-that's what role models are all about. By consciously searching for and identifying personalities that you admire and desire you can change the way you think and feel. 1. Find someone who has personality traits you would like to have in your life. This person can be a real person, TV character, or book character. 2. Identify a few mannerisms, modes of dress, or behaviors that are unique to that person. 3. Begin integrating those unique traits into your daily life. It can be as simple as using a hand gesture or wearing a particular article of jewelry. Even wearing the same type of cologne or perfume is often enough to bring the entire set of personality traits into your life. Be patient with this process. It may take a few days or a few months for all of the traits you desire to show up. You'll be surprised and delighted, though, at how quickly you can achieve very real and substantial results with this process. We always crack up when we see those Dr. Scholl's commercials on TV because those people are so mellow and happy - they seem to have everything that we strive to achieve in magic with the help of a little gel insole! If only it were that simple. We get so many emails everyday from people who tell us that they are definitely NOT gellin' and ask us for magical help. So what can you do if you're not gellin'? Here's what's really happening when we're not gellin' - we're coming under what's called "The Law of Accident." The Law of Accident specifies that unless we specifically create our experience with intention and intentional acts, we're basically little balls bouncing around the giant pinball machine of life at random. That often means we get into fender-benders or arguments, or suddenly face unexpected events and expenses. One of our clients, Joanna, asked us for some general help because she seemed to be experiencing a lot of "static" in her life. She couldn't really put her finger on anything specific, things just didn't seem to gel. She seemed to have a number of run-ins with her coworkers, her car insurance took an unexpected climb so she couldn't meet all of her bills one month, the lock on her back door broke, several lunch appointments cancelled on her ... a bunch of little events that went wrong with no specific cause. And no amount of magical fixing on her part seemed to work. We did several Tarot readings on Joanna and discovered that she was suffering from an accumulation of psychic lines from various sources - we didn't exactly know why and didn't feel the need to dig any deeper since we could easily clear it up. We did a long distance clearing and cut all the messy, sticky psychic lines that were attached to her. These lines didn't have anything to do with the many healthy relationships in Joanna's life - just to events and relationships that weren't working. We also had her do some four element cleansing of herself and her personal space. Finally, we had her program and wear a psychic shield of the seven-pointed faery star to keep herself free from any future psychic lines. The results? We heard from Joanna several months later and she reported feeling "free and light." No more static and she was back to gellin' in life. She describes the change as a change in the "tone" of her life - life as viewed through a sunny kaleidoscope rather than a cloudy one. Everything just works better. And that's really how it works. We are bombarded by psychic impressions and lines everywhere we go. When someone has an argument in your house, your walls absorb that discordant psychic energy. If you then bump into that wall, you also absorb that energy. That's why it's so important, especially to shamans and magicians, to keep clear sacred space around you. Whether you clear your space with a pendulum, firebowl, meditation, or other ritual, just do it! It will keep you free and clear to attract the things you really want in your life. Ready to put magic to work in your life so you too can be gellin'? A great place to start is with our Kindle Witchcraft Spell Books series. Having trouble sleeping at night with worries tumbling through your head and possibly into your dreams? Writing can help you release your worries, concerns and troubles so you can get a good night's sleep. This magical exercise works well as a nightly magical ritual, but can also be done any time you need to work through stressful or traumatic issues. It is one of the many techniques presented in our Daily Rituals for Attracting What You Want in Life ebook. 1. Set an appointment with yourself during a specific time each day. Nighttime works well to clear out troubles or issues that have come up during the day to prepare you for sleep, but it can be any time throughout the day. Put the time on your calendar or whatever system you use to remind yourself of appointments. 2. At the appointed time, sit down for 5 minutes with paper and pen. 3. Use a watch or timer to time yourself to stop at the end of 5 minutes. 4. Start writing all your negative thoughts, worries, concerns or any issues that came up during the day to cause you stress. Write down as much as you can during your 5 minutes – information about the issues, how you feel about them, what your worries (rational or irrational) about them are, etc... Anything that comes into your head about them. 5. At the end of 5 minutes, stop writing. Writing for just 5 minutes ensures that you get your issues down on paper, but that they don't overwhelm your life. Writing for too long a time will cause you to become too attached to the issues. Having a 5 minute appointment with yourself also helps ensure that you will keep doing this ritual and consistency is important for it to work. People tend to make excuses of not having time to do rituals that take longer, but everyone can work 5 minutes into their schedule. Make sure you have a safe place to keep the paper you have written on. It should be kept somewhere that you cannot see it or touch it during the normal course of your day. You might have a special file folder to keep it in a file cabinet or have a special notebook that you keep put up on a shelf. Wherever you choose to keep it, just make sure it is kept separate from your daily life. After all the point of the exercise is to get these issues out of your life, so you don't want to be stumbling across them all the time. Follow this procedure with discipline and consistency each night and you will soon find that the worries, troubles and concerns that were bothering you have stopped being so important and bothersome. I'll say it again - Consistency is a key element in the results of the exercise. Done consistently, you will start to see a division between daily life and your private or rest times. These bothersome issues will interfere less and less with your daily life and you'll be able to get a better night's sleep.